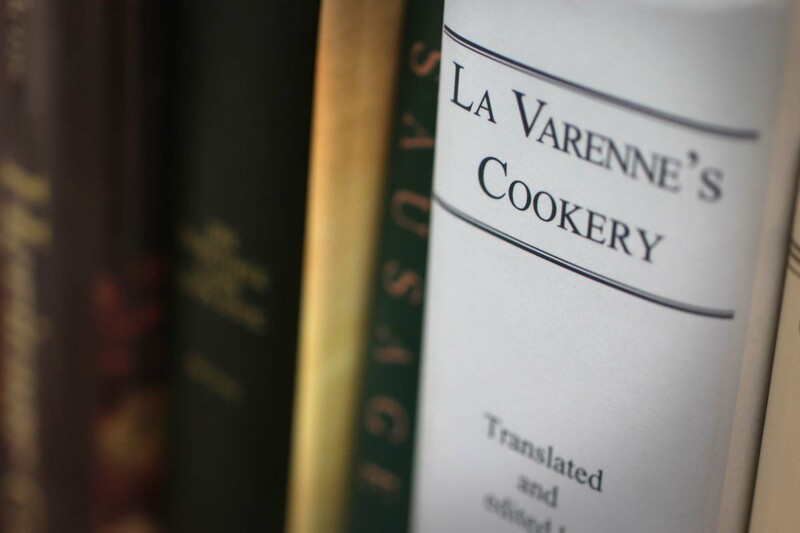 We have a modest collection of cookbooks, both old and modern, as well as secondary resources related to the topic 18th century cooking here in my office. I appreciate being able to read other people’s interpretations of the old recipes, to see how my conclusions line up with collective wisdom. I have my favorites: Karen Hess’s epic annotative work, for instance, titled Martha Washington’s Booke of Cookery, and C. Anne Wilson’s classic, Food and Drink in Britain. The Oxford Companion to Food and even the Oxford English Dictionary have also proven on multiple occasions to be invaluable sources of information. When it comes to research, however, my greater joy and satisfaction comes from the challenge of searching through and deciphering the original texts. Primary research can be difficult. If you’ve attempted it before, you know the biggest challenge is usually access. Most of the books in which I’m most interested are locked away in climate-controlled vaults. They are available by appointment only, if at all. And if I’m ever fortunate enough to lay my eyes on one, laying my hands on it is another story. Someone else wearing cotton gloves will no doubt be there to turn the pages for me. It’s not conducive to heavy-duty batter-splashing research. But when it comes to researching food history, there is one amazing primary research tool to which anyone with a computer and an internet connection has access, any hour of any day: Google Books. I use Google Books almost daily in my research. There are a few navigation challenges that I’m still not sure I’ve completely figured out. But over recent years, I’ve been able to establish a rather extensive virtual collection of original documentation. No cotton gloves needed. There are different levels of access to the various books in Google’s collection. Some are available in print form only. Click on the link provided and it will take you to a retailer who will gladly sell you a paperback copy at a reasonable price. Another type of digitized book offers a “snippet view,” or partial glimpses designed to entice you to buy the printed book. There is a tremendous number of books, however, that are available online, fully digitized and completely free for your perusal. These are the books on which I focus. 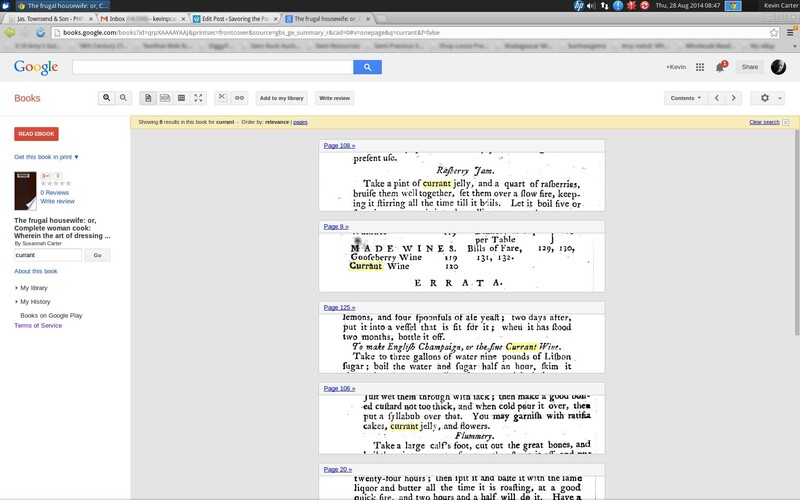 A full-view book in Google Books is searchable. Searches can also be done (with limited success) across your entire virtual library. The true beauty of what Google has done is that each of these digitized books is completely searchable. open a book, enter a word in the search window, and the search engine will show you nearly all of the word’s occurrences in that book. You can save the book to your library. Then go to your library and enter that same word in the search window, and theoretically, Google will show you where the word appears across your library collection. I say theoretically, because the results of this technique are not as reliable as conducting a search through each individual book. Do you want to search across Google’s entire collection? Use the search tools to refine the scope of your search. For instance, do you wish to research “gravy” in original documents that were published in, let’s say, the latter half of the 1700s? You can set those parameters. Welcome to my virtual library, feel free to borrow anything of interest. If you’re interested in trying this, let me give you a head start. Welcome to my virtual library of 18th and early 19th century cookbooks. Please feel free to look all you want. And feel free to borrow any of the books in my collection — and don’t even bother returning them! You’ll notice that many of the books in this collection are first editions. It’s not an all-inclusive collection, but I’m fairly certain that, as of the date of this post, it includes nearly every full-view 18th century English cookbook available free on Google Books. I’m still refining my early 19th century collection. I describe this collection broadly as that of English cookbooks. While most of the books were published in London, many of these books would have been used both in Great Britain as well as in North America. Catherine Parr Strickland Traill, for instance, in the book The Back Woods of Canada, mentions The Cook’s Oracle — a very British cookbook that she presumably possessed (or was at least very familiar with) during her adventure into what is now western Ontario. Susannah Carter’s 1796 cookbook, The Frugal Housewife, is the earliest book I have found that was actually published in North America. But it is still a very British cookbook. It is not until well into the 19th century that cookbooks on this side of the pond began to take on true American flavor. The Whole Duty of a Woman, (London). First published in 1701. Free editions available on Google Books: 1707, 1737. A Collection of Above Three Hundred Receipts, Mary Kettilby, (London). First published in 1714. Free editions available on Google Books: 1714, 1734. The Compleat Confectioner, Mary Eales, (London). First published in 1718. Free editions available on Google Books: 1742, 1767. The Cook’s and Confectioner’s Dictionary, John Nott, (London). First published in 1723. Free editions available on Google Books: 1723, 1724. The Country Housewife and Lady’s Director, R. Bradley, (London). First published in 1727. Free editions available on Google Books: 1732, 1736. The Compleat Housewife, Eliza Smith, (London). First published in 1727. Free editions available on Google Books: 1739. The Compleat City and Country Cook, Charles Carter, (London). First published in 1732. Free editions available on Google Books: 1732, 1736. The House-Keeper’s Pocket-Book, Sarah Harrison and Mary Morris, (London). First published in 1733. Free editions available on Google Books: 1739, 1760. The Complete Family Piece, M.L. Lemery, (London). First published in 1736. Free edition available in Google Books: 1737. The London and Country Cook, Charles Carter (London). First published in 1749. Free editions available on Google Books: 1749. English Housewifery, Elizabeth Moxon, (London). First published in 1749. Free editions available on Google Books: 1764. The Art of Confectionary, Edward Lambert, (London). First published in 1750. Free editions available on Google Books: 1761. The Prudent Housewife, Mrs. Fisher, (London). First published in 1750. Free editions available on Google Books: 25th Edition. A New and Easy Method of Cookery, Elizabeth Cleland, (Edinburgh). First published in 1759*. Free editions available on Google Books: 1755. *The 1759 publication date is according to Arnold Whitaker Oxford, in his book All English Cookery Books: from 1500 to 1850, (from which I’ve gather the first edition data in this post). This date appears to be incorrect, as the publication date listed in the book itself is four years earlier. A Complete System of Cookery, William Verral, (London). First published in 1759. Free editions available on Google Books: 1759. The Complete Confectioner, Hannah Glasse & Maria Wilson (London). First published in 1760. Free editions available on Google Books: 1800. The Experienced English Housekeeper, Elizabeth Raffald, (Manchester). First published in 1769. Free editions available on Google Books: 1769, 1803, 1806. The Lady’s, Housewife’s, and Cookmaid’s Assistant, E. Taylor, (Berwick Upon Tweed). First published in 1769. Free editions available on Google Books: 1769. The Court and Country Confectioner, Mr. Borella, (London). First published in 1770. Free editions available on Google Books: 1770. Cookery and Pastry, Susanna MacIver, (Edinburgh, London). First published in 1773. Free editions available on Google Books: 1789. The Lady’s Assistant, Charlotte Mason (London). First published in 1777. Free editions available on Google Books: 1777, 1787. The London Art of Cookery, John Farley, (London) First published in 1783. Free editions available on Google Books: 1783, 1785, 1792, 1797, 1800. The English Art of Cookery, John Briggs, (London). First published in 1788. Free editions available on Google Books: 1788, 1798. The Complete Confectioner, Frederick Nutt (London). First published in 1789. Free editions available on Google Books: 1790, 1807, 1819. The Practice of Cookery, Mrs. Frazer, (Edinburg). First published in 1790. Free editions available on Google Books: 1791, 1820. Every Woman Her Own Housekeeper, John Perkins, (London). First published in 1790. Free editions available on Google Books: 1796. The Universal Cook, Francis Collingwood and John Woollams, (London). First published in 1792. Free editions available on Google Books: 1792, 1797, 1806. The New Experienced English Housekeeper, Sarah Martin, (London). First published in 1795. Free editions available on Google Books: 1795. The Frugal Housewife, Susannah Carter, (Philadelphia). Free editions available on Google Books: 1796, 1822. The Accomplished Housekeeper, T. Williams, (London). First published in 1797. Free editions available on Google Books: 1797. The London Complete Art of Cookery, [Likely a fraudulent copy of Farley’s book](London). First published in 1797. Free edition available on Google Books: 1797. The Art of Cookery Made Easy and Refined, John Mollard, (London). First published in 1801. Free editions available on Google Books: 1802, 1808. The New Practice of Cookery, Mrs. Hudson and Mrs. Donat, (Edinburgh). First published in 1804. Free editions available on Google Books: 1804. Culina Famulatrix Medicinae, Alexander Hunter, (York). First published in 1804. Free editions available on Google Books: 1804. The Housekeeper’s Instructor, William Henderson (London). First published in 1804. Free editions available on Google Books: 1805. A Complete System of Cookery, John Simpson, (London). First published in 1806. Free editions available on Google Books: 1806, 1816. The Female Economist, Mrs. Smith (London). First published in 1810. Free editions available on Google books: 1810. American Domestic Cookery, Maria Eliza Ketelby Rundell, (New York). Free editions available on Google Books: 1823. The Art of French Cookery, A.B. Beauvilliers, (London). Free editions available on Google Books: 1827. Houlston’s Housekeeper’s Assistant, (Wellington, Salop). Free edition available on Google Books: 1828. The Cook’s Dictionary and Housekeeper’s Directory, Richard Dolby (London). Published in 1830. Free editions on Google Books: 1830. Seventy-Five Receipts for Pastry, Cakes, and Sweetmeats, Eliza Leslie, (Boston). Free editions available on Google Books: 1830, 1836. The Cook’s Own Book, N.K.M. Lee, (Boston). Free editions available on Google Books: 1832, 1840, 1842, 1854. The Complete Economic Cook, Mary Holland, (London). First published in 1836. Free editions available on Google Books: 1837. A Treatise on Bread and Breadmaking, Sylvester Graham, (Boston). Free editions available on Google Books: 1837. The Virginia Housewife, Mary Randolph, (Baltimore). First published in 1838. Free editions available on Google Books: 1838. The Good Housekeeper, Sarah Josepha Buell Hale, (Boston). Free editions available on Google Books: 1839. Dictionary Rusticum or Husbandry, Gardening, Trade, and Commerce, (London). Free edition available in Google Books: 1726. The London and Country Brewer, William Ellis, (London). Published in 1737. A Present for a Servant-Maid, (London). First published in 1743. Free editions available on Google Books: 1744. A Treatise of All Sorts of Foods, (London). Published in 1745. Every Man His Own Brewer, Samuel Child, (London). Published in 1768. Valuable Secrets Concerning Arts and Trades, (London). First published in 1775. Forme of Cury: a Roll of Ancient English Cookery, Edward Stafford, (London). First published in 1780. Food in Health and Disease, Isaac Burney Yeo, (London). Established in 1785. The New Family Herbal, William Meyrick, (Birmingham). Published in 1790. Antiquitates Culinariae: Or Curious Tracts Relating to the Culinary Affair of the Old English, Richard Warner, (London). Published: 1791. A Journey from Prince of Wale’s Fort in Hudson Bay, to the Northern Ocean, Samuel Hearne (London). Published in 1795. A Treatise on the Brewing of Beer, E. Hughes, (Uxbridge). Published in 1796. The Backwoods of Canada, Catherine Parr Strickland Traill, (London). Published in 1836. This entry was posted in 18th Century Cooking, Historic Cooking and tagged cook books, electronic, free, searchable. Bookmark the permalink. 26 Responses to 18th and Early 19th Century Cookbooks: Searchable, and FREE. The Compleat Housewife, by E. Smith was first published in England in 1727, but it was also re-printed/published in 1742 here in the British American colonies by the printer at Williamsburg, VA. So it pre-dates Susannah Carter’s work. And yes, it (Carter’s book) was re-printed in Boston (in 1772), but it, too, was originally published in England (circa 1765). Of course, American Cookery, by Amelia Simmons, was the first cookbook published (1796) in America that was also written by someone who was born, and lived, on this continent. But then, many of her receipts (recipes) were stolen, er, “borrowed” from previous British works, so…. But heck, by and large, we all were British, anyway! Another British cookbook published in the United States in the 1700s is “The New Art of Cookery” (Philadelphia, 1792) by Richard Briggs. I would also like to mention “Feeding America: The Historic American Cookbook Project” from Michigan State University. You can search the text and view page images of 75 cookbooks published from 1798 to 1922 online at this web site http://digital.lib.msu.edu/projects/cookbooks/index.html. Finally, “The Virginia House-wife” was first published in 1824, not 1838; Mrs. Randolph died in 1828. Amazing list! Thank you for sharing these great books!!! What a fantastic resource! I am really keen to look into some of the olde recipes I have heard about. I had a Mrs Beaton once, I wonder if I still do? I may find out some day if I can get the rest of my stuff from the lockup in NZ. Just thrilled to find this site! My sister posted it on FB because she knew I am an avid reader of old cookbooks. Nice to find all the info here and others with the same interest. Thank you for posting all the cookbooks to read. I am going to be very busy! I’m glad you found this site too! Happy experimenting! Oh, this is great! I absolutely love reading 18th and 19th century books, so this looks like an excellent source for good reads! I’ve already been reading Joseph Plumb Martin’s book thanks to your videos’ many references to it. This online project is also available for free and has downloadable pdfs of many of the cookbooks that you reference. This is a good thing coming from Michigan! Oh my! An awesome list. I would of never found these by myself. Thank you! Thank you so much. Have been wanting something like this, I love history! Thank you for mentioning us. Actually, these books have been digitized by Google. We have gathered then into one library. I have recently been the recipient of a very old cook book. I believe it is original.It is titled, “The Family Jewel and the Compleat Housewife’s Companion: or, The Whole of of Cookery made Plain and Easy.” It was authored by Mrs. Penelope Bradshaw. This is the Third Edition. Published in London: printed for R. Whitworth, at the Feathers, in the Poultry. Date: 1754. It is typed in Old English. If anyone is interested, I can send pictures. I wish to sell this beauty. thank you so much for this website. I am looking through the cookbooks and loving them. I can see now why you use so much nutmeg. This spice is in a lot of recipe’s, as well as rose water, which surprised me. Great cookbook. .